Every time I hear someone quote John 14:6 as proof that the Christian religion is the only way to God, I cringe. Is it possible that there is a God that condemns people because they don’t follow the correct religion? I know there are plenty of religious fundamentalists (in particular Muslims and Christians) who do believe their religion is the only true faith, and everyone else is going to hell. I can’t imagine God is that small. 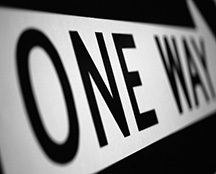 Could it be that Jesus is “one way to God,” but not the “only way to God?” And that His message is more about a way of living, and less about a way of avoiding torment in an afterlife? Lectionary Commentary: “A Progressive Christian Reading of John 14:6” (for Sunday, May 22, 2011).